The bride and groom embrace at the fountain of Centennial Park as the blue sky reflects off the water. Karina and Abimael had a wonderful summer day for their Catholic wedding ceremony at St. Casimir Church in Hammond, Indiana. My morning was spent at the bride's Aunt's home for prep for the big day while second photographer Lauren was at the couple's home capturing the guys. Bridal prep for a summer wedding in Hammond, Indiana. The early afternoon wedding at St. Casimir Church saw the groom getting a pep talk from his groomsmen and one of the flower girl's watched in awe as Karina came down the aisle with her father. The bride and groom carried on the tradition of the Spanish lasso rosary signifying the unifying of the couple together in marriage for their entire lives. They exited to bubbles and a BRIGHT summer sun. Catholic wedding ceremony at St. Casimir Church in Hammond, Indiana. The spectacular architecture of St. Casimir Church during a wedding ceremony. One of the things I like to do on super bright sunny days is to utilize the sun to my advantage in different ways. At times I might create a sun star for a dramatic wedding photo with sun flare shooting toward the bride and groom. Other times, a more dreamy bride and groom wedding picture is in order. For Karina and Abimael's wedding photos, we went all around Centennial Park getting a little bit of both. A sun star in the blue sky for this summer wedding photo of the bride and groom. 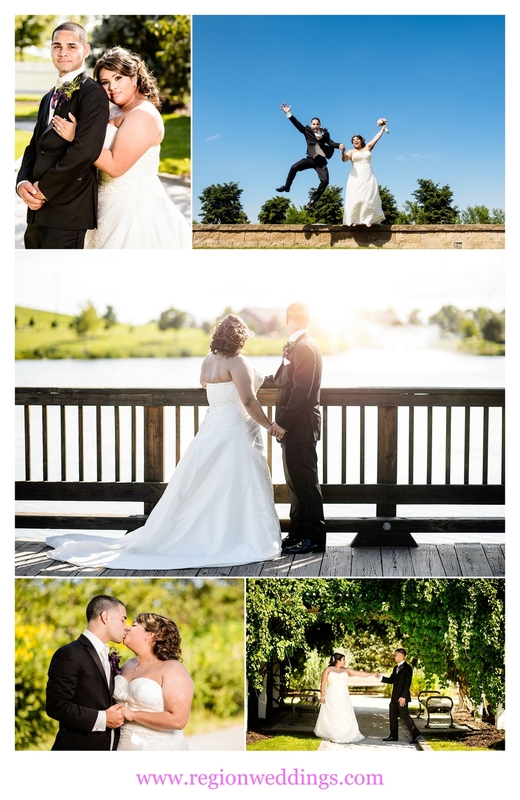 Summer wedding photos at Centennial Park in Munster, Indiana. The wedding party just rocked it as we went all around the park in the heat and blistering sun. I can tell that these are really good friends of the bride and groom and their love for the happy couple really showed. A big group hug for the wedding party on the bridge at Centennial Park. Father and daughter dance at St. Elijah Serbian American Hall in Merrillville, Indiana. Wedding reception fun at St. Elijah Hall. 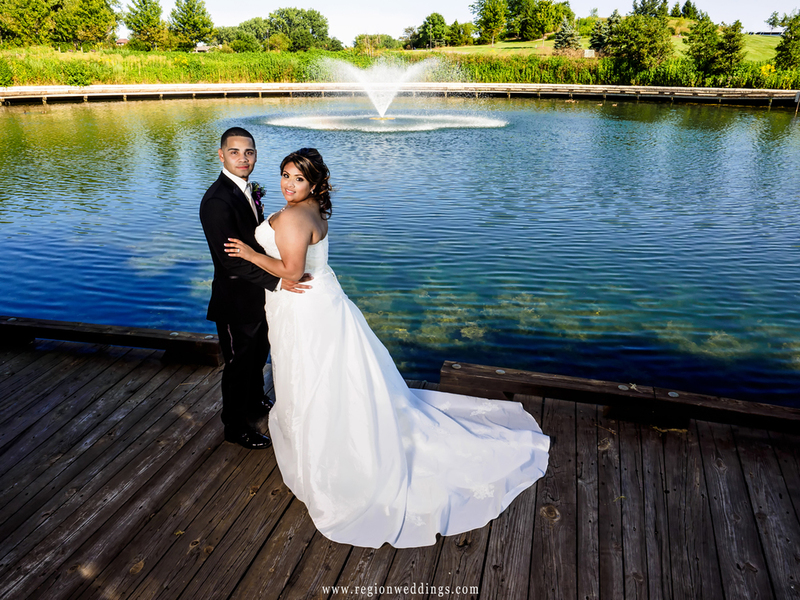 We had a blast capturing Karina and Abimael's big day. This is merely a sneak peek so do tune in to the Region Weddings Instagram feed for more images. Don't forget to fill out the Contact Form to inquire about your big day.